Smartwatch maker Pebble released a massive update today that brings about an updated UI and new features. Best of all, the update is available for most Pebble smartwatches, new and old. 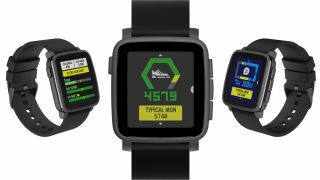 Pebble began targeting the fitness crowd earlier this summer with an updated Pebble Health app for Android and iOS. Today's update focuses on the Pebble Health app on the smartwatch itself, making it easier to quickly glance at important info. Pressing the Up button on your Pebble will now show you your step and sleep performance. You can press the Right button from each info card to find more in-depth info. Pebble Health for Android and iOS also gets some minor updates that make it easier to understand Activity and Sleep graphs. The update is compatible with the Pebble Time, Pebble Time Steel, Pebble Time Round, and the upcoming Pebble 2 and Time 2. First-gen Pebble owners are, unfortunately, out of luck. Today's update also speeds up Pebble's watch interface. From your watch face, you'll be able to see more of your upcoming agenda (up to three days ahead) by pressing down. There's also a new quick launcher that gives you access to your most used features. Simply press the Select button to see these options. Pebble also added quick launch buttons for getting things done quickly. You can program the Up, Down, Back and Select buttons to launch your favorite apps. Even the Pebble smartphone app gets in on the action with cleaner menus and faster performance. Access quick actions by pressing the Select button from your watch face. Last but not least, iOS users can finally act on their emails from their Gmail accounts. Pebble experimented with this feature not long ago, but now it's available to everyone. Pebble's support for iOS Email Actions allows you to Delete, Archive, Mark as Read, Reply All and Star emails on the smartwatch. The update also brings voice replies to email as well, so you can finally answer emails with your voice like you could already do with text messages. Pebble brags it's the only non-Apple smartwatch that can send replies to received iOS Messages, which gives it a leg up on Android Wear on iOS. Using an Android Wear watch with iOS only prompts you to reply by opening the app on your iPhone. "Actionable notifications like Pebble email and text replies are a bit easier to implement for Android users, thanks to that operating system's more open philosophy, but we're always working to make the Pebble experience consistent for both mobile platforms," writes Pebble in a blog post. With the wearables market in decline, Pebble is focused on making its core features faster and better, as well as attracting fitness buffs from companies like Fitbit. Only time will tell if its strategy pays off.